Just to be clear this is not an ad for Warby Parker. I actually was curious to try the service and ordered (and paid for) my glasses myself. I thought I’d share a very quick post about the experience for any of you that might be considering the whole ordering glasses online experience too. 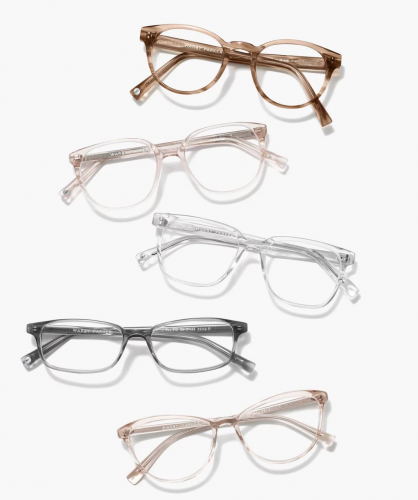 If you are not familiar with Warby Parker, they are an online retailer that offers eyeglasses and sunglasses at a discount. 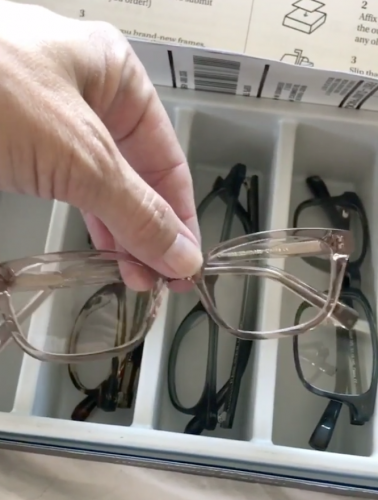 You get to try on several frames, choose the one you like best and using your prescription, place your order online and have them shipped to you. Overall I thought it was a really seamless process. I wear glasses at night and contacts during the day so I didn’t want to invest a significant amount in my glasses. The glasses at my eye doctor are just way too expensive and even at Costco I find discounted prices but limited styles. Once you select the frames you want you just go online and upload your prescription from your doctor and place your order. I also had to do this measurement thing that just required clicking a button to take a photo of my face and clicking submit. Now for the real info. What do I think of the glasses? Well I have mixed reviews. On one hand I love the style. They are so much cuter than my old glasses. I would definitely wear these out in public no problem. The plastic is fairly hard so it does feel less expensive than my previous pair. I did put these up against my daughter’s Costco glasses and they do feel somewhat comparable. A similar style in a better quality frame from the eye doctor would have been at least three times what I paid so for the price, I am very happy with the purchase. I have one little complaint and that is that the arm of the glasses is too long. If I am resting my head on the couch or on a pillow, the arm of the glasses pushes them off my face. Apparently this is a really easy fix so I am going to try bending the arm slightly myself and if that doesn’t work, Warby Parker has a handful of retail locations to have glasses adjusted or you can request up to $50 back on a single adjustment from an optician. All in all, I would definitely order from Warby Parker again. You can click here to take a look at the frames they offer and see what you think. Anyone else a Warby Parker customer? We’d love to hear your experiences as well. And I didn’t mention this above but for every pair of glasses purchased, Warby Parker sends a pair of glasses to someone in need. It is actually a really cool company that you can learn more about by listening to the How I Built This podcast here. I bought some frames only from Zenni (no lenses–got those from the eye doctor). I am so-so on them as well and for the same reasons. I like the style a lot but feel that the quality is below what you would get at an eye doctor’s office. I’ve had them about 4 months and see rust on the frames where the lenses meet the frame. It MAY be because I wore them in the ocean–I probably should have washed them after that. I am planning to order the same frame only again and put the lenses in the new frame and take better care of them this time. We’ll see how it goes! Oh yup! I bet the ocean water was the culprit. 🙁 It certainly was easy to order though and I get overwhelmed at the eye doctor so I am happy with my glasses. Thanks for sharing your experience Elene!